For the sixth time since the Affordable Care Act became law in 2010, top state insurance officials, economists and academic health services researchers from across the country gathered at the University of Pennsylvania to discuss the issues and future of the ACA's health insurance exchange system. The 2018 Annual Health Insurance Exchange Conference occurred at a time when the law, as well as the 50-state-matrix of marketplaces rolled out in 2014, grappled with daunting challenges. 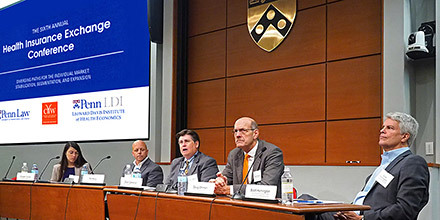 Co-sponsored by the Penn Law School, the Leonard Davis Institute of Health Economics (LDI), and Princeton University's Center for Health and Wellbeing, the two-day conference was funded by the Robert Wood Johnson Foundation. As in all previous years, it was a "Chatham House Rules" or off-the-record gathering to ensure that all participants could frankly offer their comments and observations about the government-run insurance marketplaces. Penn Law Professor and LDI Senior Fellow Tom Baker, JD (above left), opened the conference. He noted the last six years "have been quite a ride. Every year we've thought next year would probably be kind of boring with not much to talk about but somehow, each following year has always had plenty to talk about," he said to a round of laughter. Above, right, asking questions of the Keynote panelists is Chief of Staff of the Pennsylvania Insurance Department Alison Beam, JD. The Keynote Panel (above, left) consisted of Stephen Parente, PhD, MPH, Professor and Chair of Health Finance at the University of Minnesota's Carlson School of Management; John McDonough, DrPH, MPA, Professor of Public Health Practice at the Harvard T.H. Chan School of Public Health; and Joel Ario, Managing Director of Manatt Health Solutions at Manatt, Phelps & Phillips, LLP. Above, right, seated on the "New State Flexibility: Charting Alternative Paths" panel were Christen Young, Brookings Institution Fellow and former Principal Deputy Secretary for the North Carolina Department of Health and Human Services; Pat Kelly, Executive Director of the Your Health Idaho health insurance exchange; Dean Cameron, Director of the Idaho Department of Insurance; Doug Ommen, Iowa Insurance Commissioner; and Scott Harrington, PhD, Professor and Chair of the Wharton School Health Care Management Department and an LDI Senior Fellow. At the podium (above, left) is Michael Dickstein, PhD, Assistant Professor of Economics at New York University's Stern School of Business. The rest of his panel included (l to r) Jonathan Kolstad, PhD, Associate Professor of Economic Analysis and Policy at the UC Berkeley Haas School of Business and a Research Associate at the National Bureau of Economic Research; Evan Saltzman, PhD, Assistant Professor of Economics at Emory University and a recent graduate from Wharton's Health Care Management Department; Jason Abaluck, PhD, Associate Professor of Economics at Yale School of Management; and Robert Town, PhD, Professor of Economics at the University of Texas at Austin. Above right, scheduled to deliver his "Report from DC" on the first day of the conference, Tim Jost, JD, appeared via video after he was treated for a pulmonary embolism just days before the event. He's a Washington and Lee University School of Law professor. On the "States Leaning in: The Stabilization Path" panel were (l to r) Zachary Sherman, Director of HealthSource RI, Rhode-Island's health insurance exchange; Nathan Clark, Chief Executive of MNsure, Minnesota's health insurance exchange; Heather Kobulic, Chief Operating Officer, Nevada's Silver State Health Insurance Exchange; Kevin Patterson, Chief Executive Officer of Health Colorado, Colorado's health insurance exchange; Michael Conway, Colorado Insurance Commissioner; and Heather Howard, JD, Lecturer at Princeton University's Woodrow Wilson School of Public and International Affairs, Director of the RWJF-funded State Health and Value Strategies program that provides implementation technical assistance to state insurance exchanges. Above, right is a close-up of Howard. In between sessions there was plenty of time for socializing. Above, left, Robert Town, a former Penn Professor and LDI Senior Fellow, catches up on Penn news with Tom Baker. Above, right are Charleen Hsuan, PhD, JD, Assistant Professor of Health Policy and Administration, Penn State Law School; Heather Howard; and Allison Hoffman, JD, Professor of Law at the Penn Law School. Enjoying a coffee break (above, left) are LDI Senior Fellow Janet Weiner, PhD, MPH, Co-Director for Health Policy at LDI and Mark Pauly, PhD, Professor of Health Care Management at the Wharton School and LDI Senior Fellow. Above, right, are Eric Ellsworth, Director of Health Data Strategy at Consumers Checkbook/Center for the Study of Services; Daniel Polsky, PhD, Executive Director of LDI and Wharton School Professor of Health Care Management; and Tom Baker. In an opening "Report from DC" (above, left) Matthew Fiedler, PhD, a Fellow with the Brookings Institution's Center for Health Policy, and former Chief Economist of the Council of Economic Advisers, detailed the latest trends in the exchanges. Above, right, Penn Law School Professor and LDI Senior Fellow Allison Hoffman, JD, noted "in past years, we saw states thinking really optimistically about building out decision support tools on exchanges and thinking about how to build the perfect network but this year there was not a lot of thinking about 'where are we going to build in the next couple of years?' It's been more about 'how are we going to react to the things yet to come?'." The venue's off-the-record status prompted energized networking throughout the two days. In discussion (above, left, foreground), are Rhode Island exchange Director Zachary Sherman, Century Foundation Senior Fellow Jeanne Lambrew, PhD, and Princeton's Heather Howard, JD. Above right and equally animated, is LDI Associate Director for Health Policy Rebecka Rosenquist, MSc. Speaking on the panel, "Medicaid Expansion and the Public Option," is Jeanne Lambrew, PhD (above, left), Senior Fellow at the Century Foundation and Adjunct Professor at NYU Wagner School of Public Service. Above, right, Chief Executive Officer of Connect for Health Colorado Kevin Patterson, MS, comments on the "States Leaning In: The Stabilization Path" panel. Above, left is panelist and Administrator of the Oregon Health Insurance Marketplace Chiqui Flowers. Above, right, Dean Cameron, Director of the Idaho Department of Insurance and former State Senator. Moderating the "Getting Beyond the ACA: The Expansion Path" panel was Abbe Gluck, JD, a Yale Law School Professor and Faculty Director of the Solomon Center for Health. Above, right, a member of the same panel was Emily Brice, JD, Deputy Chief of Policy & Strategy for the Massachusetts Health Connector. Two other panelists were (above, left) Michael Conway, Colorado Insurance Commissioner and Heather Korbulic (above, right), Chief Operations Officer of Nevada's Silver State Health Exchange.